Understanding the significance of dietary guidelines and how to use DRIs in planning your nutrient intakes can make you better equipped to select the right foods the next time you go to the supermarket. In the United States, the Nutrition Labeling and Education Act passed in 1990 and came into effect in 1994. In Canada, mandatory labeling came into effect in 2005. As a result, all packaged foods sold in the United States and Canada must have nutrition labels that accurately reflect the contents of the food products. There are several mandated nutrients and some optional ones that manufacturers or packagers include. Actual amounts of vitamin D, calcium, iron, and potassium (in addition to the Daily Value amounts) are required to be listed. Vitamins A and C are now voluntary. The compliance date for manufacturers to adopt the new label is July 26, 2018. Manufacturers with less than $10 million in annual food sales will have until 2019. 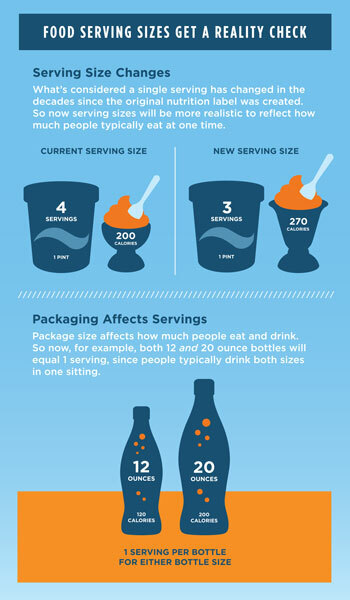 The first part of the Nutrition Facts panel gives you information on the serving size and how many servings are in the container. For example, a label on a box of crackers might tell you that twenty crackers equals one serving and that the whole box contains 10 servings. All other values listed thereafter, from the calories to the dietary fiber, are based on this one serving. On the panel, the serving size is followed by the number of calories and then a list of selected nutrients. You will also see “Percent Daily Value” on the far right-hand side. This helps you determine if the food is a good source of a particular nutrient or not. The Daily Value (DV) represents the recommended amount of a given nutrient based on the RDI of that nutrient in a 2,000-kilocalorie diet. The percentage of Daily Value (percent DV) represents the proportion of the total daily recommended amount that you will get from one serving of the food. For example, in the older food label in Figure 12.2 “Reading the Older Nutrition Label,” the percent DV of calcium for one serving of macaroni-and-cheese is 20 percent, which means that one serving of macaroni and cheese provides 20 percent of the daily recommended calcium intake. Since the DV for calcium is 1,000 milligrams, the food producer determined the percent DV for calcium by taking the calcium content in milligrams in each serving, and dividing it by 1,000 milligrams, and then multiplying it by 100 to get it into percentage format. 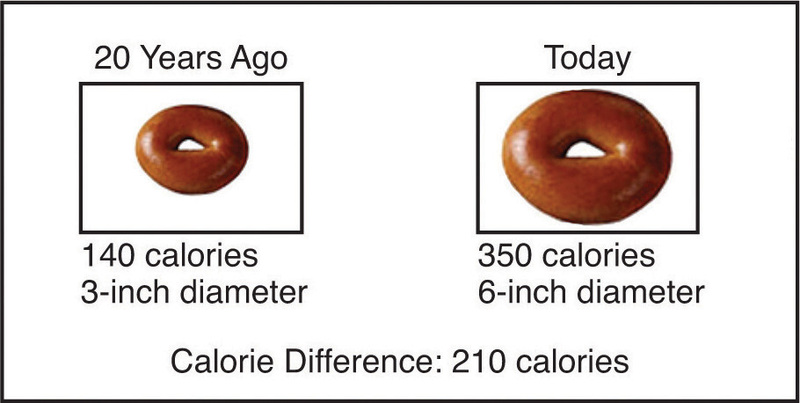 Whether you consume 2,000 calories per day or not you can still use the percent DV as a target reference. Generally, a percent DV of 5 is considered low and a percent DV of 20 is considered high. This means, as a general rule, for fat, saturated fat, trans fat, cholesterol, or sodium, look for foods with a low percent DV. Alternatively, when concentrating on essential mineral or vitamin intake, look for a high percent DV. To figure out your fat allowance remaining for the day after consuming one serving of macaroni-and-cheese, look at the percent DV for fat, which is 18 percent, and subtract it from 100 percent. To know this amount in grams of fat, read the footnote of the food label to find that the recommended maximum amount of fat grams to consume per day for a 2,000 kilocalories per day diet is 65 grams. Eighteen percent of sixty-five equals about 12 grams. This means that 53 grams of fat are remaining in your fat allowance. Remember, to have a healthy diet the recommendation is to eat less than this amount of fat grams per day, especially if you want to lose weight. A sample label for macaroni and cheese. 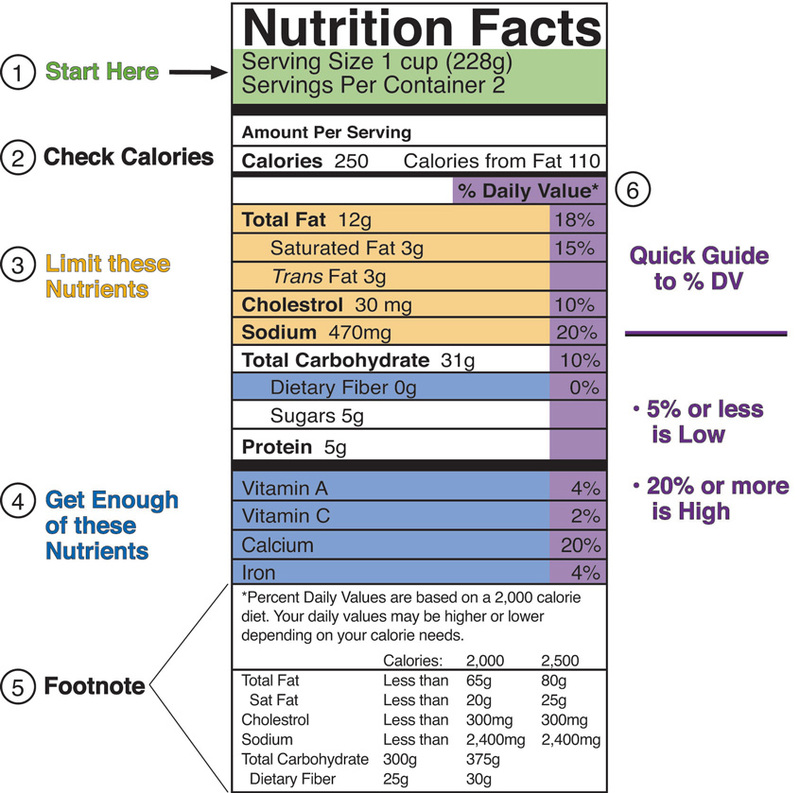 Source: How to Understand and Use the Nutrition Facts Panel. FDA. http://www.fda.gov/food/labelingnutrition/consumerinformation/ucm078889.htm#dvs. Updated February 15, 2012. Accessed November 22, 2017. The Nutrition Facts panel provides a wealth of information about the nutritional content of the product. The information also allows shoppers to compare products. Because the serving sizes are included on the label, you can see how much of each nutrient is in each serving to make the comparisons. Knowing how to read the label is important because of the way some foods are presented. For example, a bag of peanuts at the grocery store may seem like a healthy snack to eat on the way to class. But have a look at that label. Does it contain one serving, or multiple servings? Unless you are buying the individual serving packages, chances are the bag you picked up is at least eight servings, if not more. According to the 2010 health and diet survey released by the FDA, 54 percent of first-time buyers of a product will check the food label and will use this information to evaluate fat, calorie, vitamin, and sodium content. The survey also notes that more Americans are using food labels and are showing an increased awareness of the connection between diet and health. Having reliable food labels is a top priority of the FDA, which has a new initiative to prepare guidelines for the food industry to construct “front of package” labeling that will make it even easier for Americans to choose healthy foods. 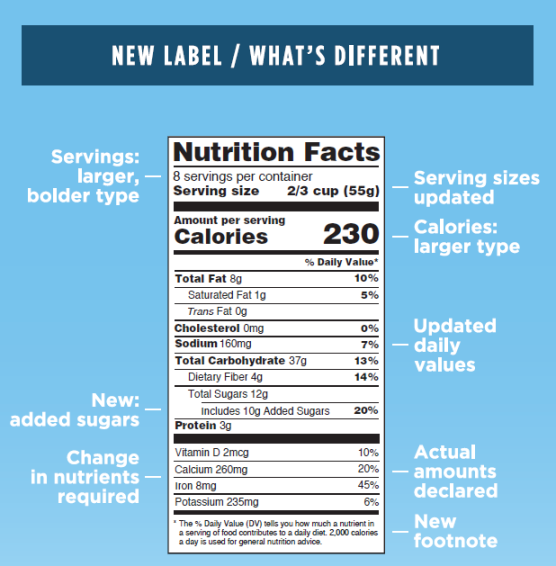 Stay tuned for the newest on food labeling by visiting the FDA website: http://www.fda.gov/Food/LabelingNutrition/default.htm. In addition to mandating nutrients and ingredients that must appear on food labels, any nutrient content claims must meet certain requirements. For example, a manufacturer cannot claim that a food is fat-free or low-fat if it is not, in reality, fat-free or low-fat. Low-fat indicates that the product has three or fewer grams of fat; low salt indicates there are fewer than 140 milligrams of sodium, and low-cholesterol indicates there are fewer than 20 milligrams of cholesterol and two grams of saturated fat. See Table 12.3 “Common Label Terms Defined” for some examples. Source: Food Labeling Guide. US Food and Drug Administration. http://www.fda.gov. Updated February 10, 2012. Accessed November 28, 2017. FDA Announces Qualified Health Claims for Omega-3 Fatty Acids. 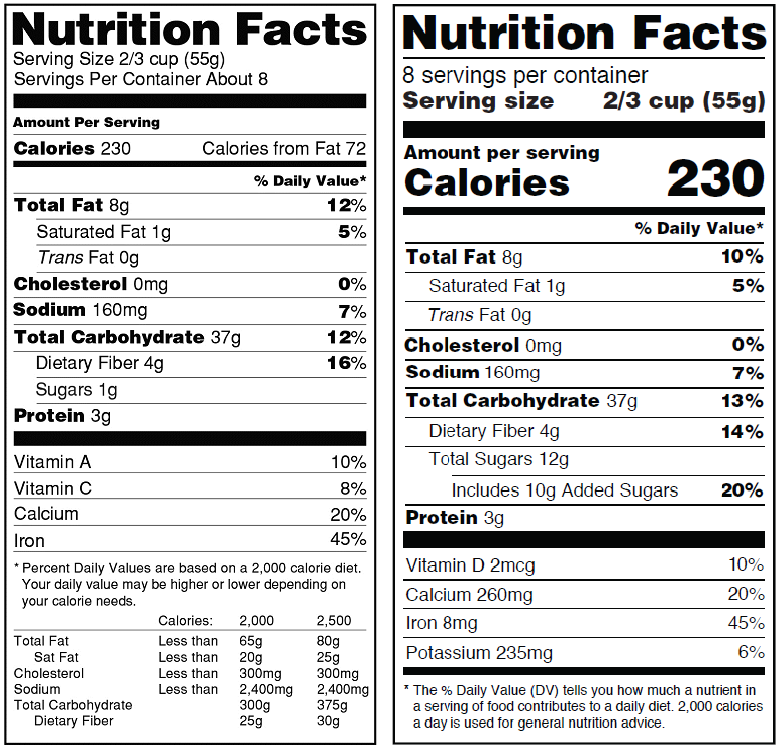 US Food and Drug Administration.https://www.fda.gov/food/ingredientspackaginglabeling/labelingnutrition/ucm072936.htm. Published September 8, 2004. Accessed November 28,2017. Some companies claim that certain foods and nutrients have benefits for health even though no scientific evidence exists. In these cases, food labels are permitted to claim that you may benefit from the food because it may boost your immune system, for example. There may not be claims of diagnosis, cures, treatment, or disease prevention, and there must be a disclaimer that the FDA has not evaluated the claim. Food manufacturers are required by the FDA to list on their packages if the product contains any of the eight most common ingredients that cause food allergies. These eight common allergens are as follows: milk, eggs, peanuts, tree nuts, fish, shellfish, soy, and wheat. (More information on these allergens will be discussed in Chapter 9 “Energy Balance and Body Weight”.) The FDA does not require warnings that cross contamination may occur during packaging, however most manufacturers include this advisory as a courtesy. For instance, you may notice a label that states, “This product is manufactured in a factory that also processes peanuts.” If you have food allergies, it is best to avoid products that may have been contaminated with the allergen. Have you ever heard the expression, “Your eyes were bigger than your stomach?” This means that you thought you wanted a lot more food than you could actually eat. Amounts of food can be deceiving to the eye, especially if you have nothing to compare them to. It is very easy to heap a pile of mashed potatoes on your plate, particularly if it is a big plate, and not realize that you have just helped yourself to three portions instead of one. The food industry makes following the 2015 Dietary Guidelines a challenge. In many restaurants and eating establishments, portion sizes have increased, use of SoFAS has increased, and consequently the typical meal contains more calories than it used to. In addition, our sedentary lives make it difficult to expend enough calories during normal daily activities. In fact, more than one-third of adults are not physically active at all. As food sizes and servings increase it is important to limit the portions of food consumed on a regular basis. Dietitians have come up with some good hints to help people tell how large a portion of food they really have. Some suggest using common items such as a deck of cards while others advocate using your hand as a measuring rule. If you wait many hours between meals, there is a good chance you will overeat. To refrain from overeating try consuming small meals at frequent intervals throughout the day as opposed to two or three large meals. Eat until you are satisfied, not until you feel “stuffed.” Eating slowly and savoring your food allows you to both enjoy what you eat and have time to realize that you are full before you get overfull. Your stomach is about the size of your fist but it expands if you eat excessive amounts of food at one sitting. Eating smaller meals will diminish the size of your appetite over time so you will feel satisfied with smaller amounts of food. Discovering Nutrition Facts by University of Hawai’i at Mānoa Food Science and Human Nutrition Program is licensed under a Creative Commons Attribution-NonCommercial-ShareAlike 4.0 International License, except where otherwise noted.